Chrysler recalls 47,800 minivans that may experience a loss of directional steering. March 14, 2019 — A Chrysler Pacifica and Pacifica Hybrid recall will see dealerships repair nearly 47,800 minivans with lower control arms that may separate from the steering knuckles. Specifically, the 2018 Pacifica minivans may suffer from separations of the right front lower control arm ball joint studs from the steering knuckles and leave drivers without directional steering control. The automaker says this can all happen without a driver receiving any warnings. Fiat Chrysler opened an investigation in November 2018 after a Pacifica experienced a separated right front lower control arm ball joint from the steering knuckle. The investigation didn't find any evidence of crashes or injuries from the problem, but FCA did find a recall was the only way to ensure safety. Chrysler believes the problem started with minivans built in November 2017 that experienced an increase in warranty claims for squeaking, rattling and buzzing from the ball joints. 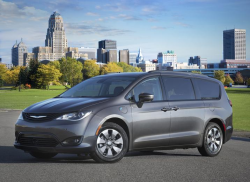 The 2018 Chrysler Pacifica and Pacifica Hybrid recall begins April 19, 2019. Dealerships will inspect the right front knuckles and lower control arms for damage and replace damaged components. In addition, the right front lower control arm knuckle pinch bolts will be replaced with larger bolts. Pacifica owners may contact Chrysler at 800-853-1403 and refer to recall number V15. CarComplaints.com has owner-reported complaints about the 2018 Chrysler Pacifica and the 2018 Chrysler Pacifica Hybrid.